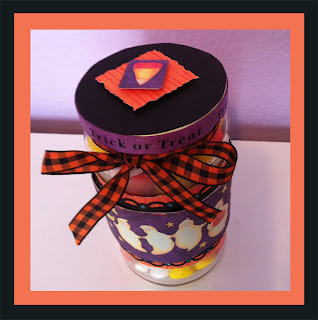 Craft Time and Cupcakes: Halloween Treat Box Blog Hop! adorable sweet project. love those Ghosts! Very cute project, love the idea. You did it! It is great! Love the altered jelly jar. Amazing project and love what's inside. Glad to be on the hop with you. New follower here! Make sure to share the love by heading over to my blog - Cher's Studio for another Fang-tastic Blog Hop going on this weekend for more inspiration! All the girls have some sweet treat giveaways! Great Project....TFS!! glad to be on the hop with you. 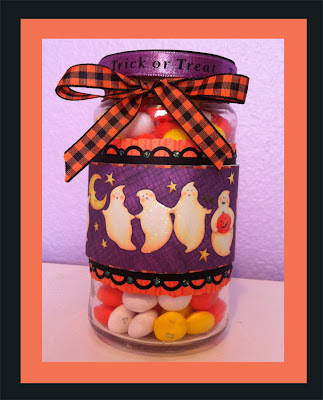 Cute altered jars :) Very adorable! Love your alter jar.... super cute. It was nice hopping along with you! having a blast being on this hop with you!! Great idea!!! Toodles!!! Very cute Kerri! I love it!! Love your decorated Jelly Jar, it is a cute candy holder. Your bottle is just adorable! I love it! What a great idea! I am a new follower. Glad to have found you on this great hop. great idea for your treat container. Wow, so cute!! Love the paper! !